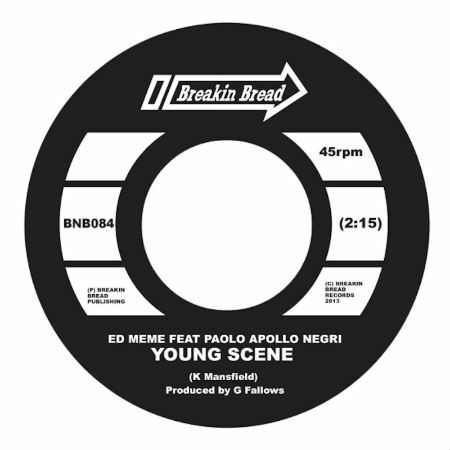 After storming onto the scene with a debut solo project last year, Impellers bandleader and songwriter Glenn Fallows returns with a new double-sider 45 under the alias Ed Meme, featuring a cover of a mod classic backed by a neo soul groover, out now on 45 and digital download via Breakin Bread Records. For Side A’s “Young Scene” Glenn brings in Apollo Negri to cover the Keith Mansfield classic from the 60s, which surprisingly hasn’t been covered in recent times. Ed Meme‘s version is dancefloor dynamite with that classic organ riff given a new twist by the boys. For the flip, Ed Meme takes you deeper with “Golden Years”, an original cut that this time round sees Guests of Nature on the vocal, delivering a sweet ode to the perils of everyday life. Glenn shows all his skills on this one with tons of instrumentation, a shuffling beat and a dubby bassline.